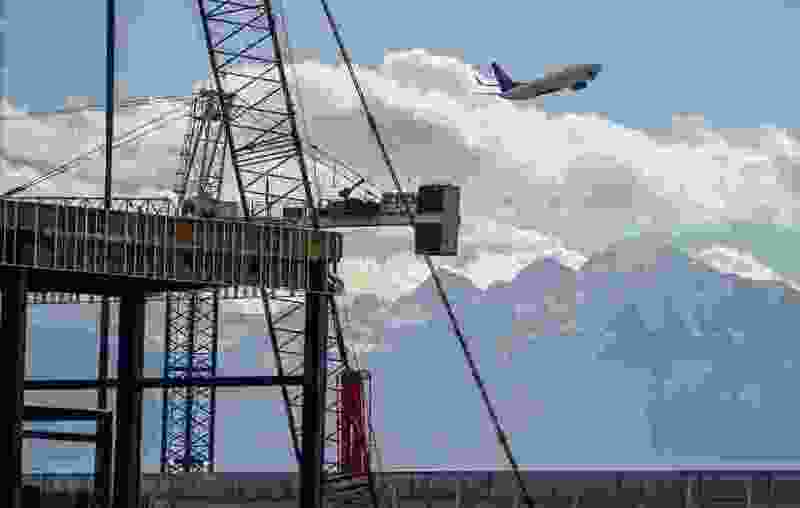 (Leah Hogsten | Tribune file photo) The new Salt Lake City International Airport expansion project, Monday, Oct. 22, 2018. The first phase construction of the $3.6 billion project is due to open in 700 days. Nearing completion is the new concourse for aircraft gates, an enclosed terminal, the steel skeleton of a new "gateway" building, a five-story parking garage and elevated roadways. 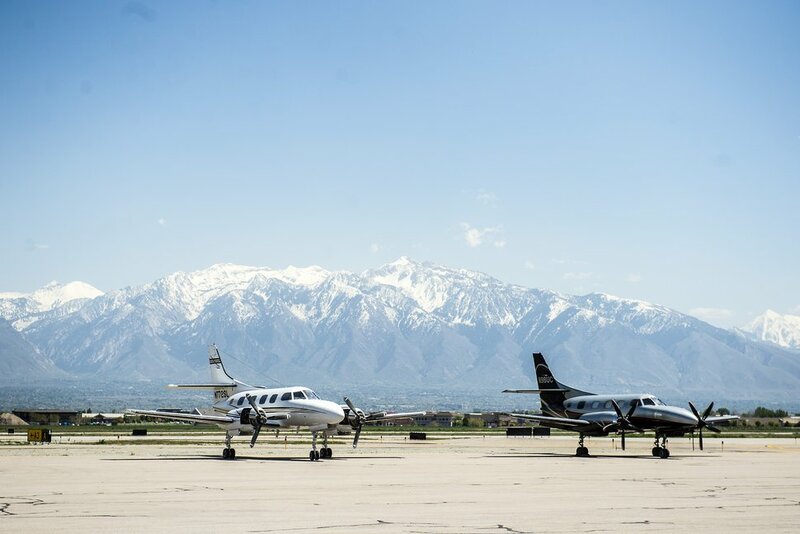 Salt Lake City International Airport officials are exploring whether it is time to start pushing small general aviation aircraft away because they tend to slow busy airline operations and limit the ability to attract more commercial flights. “It may not be reasonable to continue to provide service for small general aviation aircraft” at the main airport, Steve Domino, a consultant with RS&H, told the Airport Advisory Board on Wednesday. “While general aviation aircraft are always allowed here, we think the policy should be directed to try to encourage those small [aircraft] operations at other general aviation airports,” he said. Such alternate destinations would include the two other airports owned by Salt Lake City: South Valley Regional Airport in West Jordan and Tooele Valley Airport. Chris Detrick | The Salt Lake Tribune Airplanes at Leading Edge Aviation at South Valley Regional Airport in West Jordan Tuesday May 3, 2016. The suggestions came during an update about work on a new general aviation master plan for the three airports. Domino said it is still in the early stages. But he outlined some problems that suggest it’s time to persuade smaller aircraft to use airports besides the international airport. For example, Domino said Salt Lake City International Airport has more general aviation aircraft based there than at all of the nation’s other large hub airports combined: 178, compared to 89 in the rest of the nation. (That excludes Honolulu, which Domino said is facing problems similar to Salt Lake City). He said that as large commercial aircraft approach the airport, they are spaced about three nautical miles and 75 seconds apart. When a small propeller aircraft is added to queue, the spacing for them must be four nautical miles and 175 seconds apart. Of course, part of the international airport’s ongoing $3.6 billion rebuild project comes with an eye toward expanding commercial operations — including recently making some last-minute redesign requested by Delta Airlines that may allow more international flights with enlarged customs areas and secure international gates. Domino said the international airport should look at changing some policies that attract extra general aviation activity there, such as offering hangar rental that is cheaper than at other nearby regional airports — an average $271 monthly compared to an average $300. The national average is about $386 and averages is $320 in the West. Domino noted that many of the hangars for smaller aircraft at the international airport are older and may need to be replaced soon. He said it may be wise to replace them with larger hangars for corporate jets — noting that they fit in better with busy operations and high aircraft speeds than smaller planes. (Steve Griffin | The Salt Lake Tribune) Tracy Schmidt, executive director of the Intermountain Donor Services, stands with the new Intermountain Life Flight jet that will be used primarily to retrieve organs for transplantation in the Intermountain West, as he talks with the media during a news conference at the Intermountain Life Flight Hangar at the Salt Lake International Airport in Salt Lake City Monday October 30, 2017. Domino said the South Valley and Tooele airports also have some challenges that need to be addressed to allow them to better serve general aviation. For example, he said the Tooele airport lacks sewer service and has only a limited well-water supply — which must be remedied before any expansion. Airport director Bill Wyatt and Tooele County Commissioner Wade Bitner, a member of the airport board, said arrangements for such service are being negotiated. Domino also said the Tooele airport lacks land-use plans that could stop encroachment by residential developments, and officials should consider seeking that. Domino said some challenges with the South Valley airport include that it is in the flight path of the international airport, lacks an instrument landing system and is hampered by encroachment of residential development that limits operations and noise.